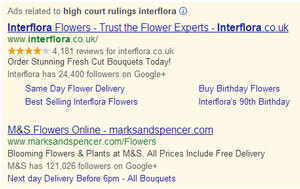 Back in 2009 Interflora Inc and Interflora British Unit began legal action against the use of their trademarked term "Interflora" as a Keyword for AdWords Ad Campaigns used by Marks & Spencer. The use of this term meant that if someone searched on Google for "Interflora", an Ad by Marks & Spencer for their own flower delivery services could appear right next to an Ad from Interflora themselves. Oh, the irony! A search for "high court rulings interflora" brings up a fine example of the very problem being debated (left). This use of competitor trademark terms is not prohibited by AdWords Policies and the practice is quite common among advertisers. It is therefore something of a shock to here today (21st May 2013) that the UK High Court has ruled in favour of Interflora and has ordered Marks & Spencer to pay damages. He concluded that the “M&S advertisements which are the subject of Interflora’s claim did not enable reasonably well-informed and reasonably attentive internet users to ascertain whether the service referred to in the advertisements originated from [M&S or Interflora]. “On the contrary, as at 6 May 2008, a significant proportion of the consumers who searched for ‘interflora’ and the other signs, and then clicked on M&S’s advertisements displayed in response to those searches, were led to believe, incorrectly, that M&S’s flower delivery service was part of the Interflora network”. It will be interesting to see if this ruling "sticks" and how it affects both Google's own Policies and the future of AdWords in general.